I met with director Arwen Curry on Saturday, November 10, 2018, at DOC NYC, to discuss her documentary portrait of the late, great Ursula K. Le Guin, entitled The Worlds of Ursula K. Le Guin (which I also reviewed). Le Guin was the author, among many other works, of A Wizard of Earthsea, The Left Hand of Darkness and the short story “The Ones Who Walk Away from Omelas.” Using archival footage, talking-head interviews and beautiful animations, Curry crafts a lovely homage to her subject, highlighting details from her writing to remind us of Le Guin’s importance as writer and intellectual. Here is a condensed digest of our conversation, edited for length and clarity. Hammer to Nail: So, what was your initial motivation? I noticed that this was an American Masters film, so … sometimes they commission, sometimes people present ideas. Was this a commissioned film or did you come up with this and then pitch it to them? Arwen Curry: Well, neither actually. This was a completely independent film, which only after its completion was acquired by American Masters for broadcast. So we, in fact, raised all our own funding and produced it before that. 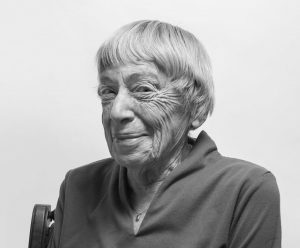 HtN: Are you a life long fan of the work of Ursula K. Le Guin? AC: I am. I am one of the people who, as Michael Chabon points out in the film, encounters her when you’re 10 years old and then remains connected to her throughout your adult life. HtN: Which one of her works did you first encounter? AC: It would have to be Earthsea: A Wizard of Earthsea, Tombs of Atuan. The idea of this young girl living underground with all this mysterious power was very compelling to me and I also read some of the grown-up books, which maybe I shouldn’t have read, on my dad’s bookshelf. HtN: My first encounter with her was “The Ones Who Walk Away from Omelas,” which really made a huge impression on me, and then I was disappointed that I did not engage with Earthsea more than I did when I read it. I should now revisit it as an adult. It’s really The Left Hand of Darkness that, in my mind, established her as one of the greats, for me, but “Omelas” is a true treasure and I really do like it. So, for how long did you work on the film, from start to completion? AC: Our first shoot was in 2008, and our last, I think, was in 2016. So, you know, that would be eight years, 10 years overall for the production, and even a bit longer from the first, you know, conceiving of the film. So, yeah, it was a long project. HtN: Now, Ursula Le Guin, unfortunately, passed away in January of this year. Did she get a chance to see any versions of the film before then? AC: Yes. Ursula saw a cut of the film in December of 2017, and she died in January. So, the film was completed in April. It did go through some changes after that. It was much refined, and I would have liked for her to see the final version, but she knew what I was up to. The structure of the film was there. She knew what I was doing with the animations. She knew what I was doing with the story and I was glad to have her feedback and I was glad that she at least got a chance to see that version. HtN: Lets talk about those animations, which are really beautiful. What’s particularly great about them is that you didn’t just take off from what’s in the Earthsea books, for example. It’s something that feels very fresh and not just an imitation of what’s in the book. I love that oil-painting texture to the animations of Earthsea. Can you describe sort of the design and inception of those? AC: So, the decision to have animations was a difficult one. I went back and forth about it because to make a visual representation of a literary world, it’s something that feels very audacious, and I did not want to either get it wrong, from her point of view, or to supplant the ideas that readers had in their own imagination of what these worlds should look like. So, you know, I tried to tread lightly and to show a kind of sideways glimpse. I hired two animators. One of them is here with us at DOC NYC, Molly Schwartz. She did the outer-space animations; she did “Omelas” and she did The Left Hand of Darkness and The Dispossessed, those worlds. Very textured, colorful work. The other animator is named Em Cooper. She did the Earthsea books and her process is she hires actors, she shoots footage and then she paints it frame by frame on glass in oil, shoots each frame with a still camera, wipes it clean. Shoots the frame with a still camera, the frame is projected onto the glass, and then it’s run together as a stop-motion animation. So, it’s incredibly painstaking and creates this very fluid, beautiful experience of those worlds. And I had shown her style and some of her previous work to Ursula, and she felt like this could be a way to show Earthsea in a way that is not too direct, but got to some of the feelings of what that world was like. HtN: It has the same sort of tactile qualities of the animation in that Vincent van Gogh film, Loving Vincent, from last year. It’s really, really quite beautiful. HtN: Now, you were previously working primarily as a producer. Is that correct? Is this your first feature as a director? AC: This is my first feature as a director. I have mainly worked as an associate producer [AP] or an archivist for a number of really exceptional films. 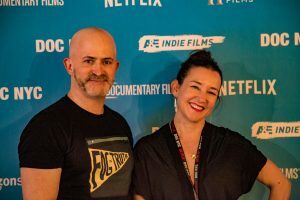 I was lucky to work on those over the past decade while I was trying to raise the funding and while I was shooting intermittently for this project. I worked on an HBO film called Regarding Susan Sontag. The director is Nancy Kates and I worked on that as AP and I worked on a film about Ray and Charles Eames, which is another American Masters film, as an archivist. So, I was the person wrangling their beautiful archival films and drawings and photographs, and that was really a pleasure. HtN: Speaking of wrangling, you have a number of wonderful talking-head interviews in the film with some of the great writers of science fiction, as well as with others. Could you talk about the process of gathering those interviews and if there were any people you wanted to have in the film who couldn’t be, for whatever reason? AC: Yeah, I wanted to have a balance of voices in the film who represented people who are contemporaries of Le Guin when she was in her heyday in the late ’60s and ’70s, as well as writers who had been influenced by her, who are in the generation of Michael Chabon and David Mitchell and Neil Gaiman, who are all in the film. And I did get some of those voices. Other people I pursued and they couldn’t do it for whatever reason. They were too busy. They didn’t end up being in the film. Like Zadie Smith and others. So there were definitely voices that I wanted to have in there that didn’t make it in, but I think, overall, we achieved the kind of balance I was hoping for. There’s also a younger generation of writers, who are really influenced by the radical imagination of Le Guin, that I wanted to represent as well. HtN: Sure. Now, since your background is as an archivist, there’s a lot of great archival footage in the film. Could you talk about the process of gathering that material? Were there any particular challenges you faced to get this whole treasure trove of historical documents, photographs and video and film in your movie? AC: There are always challenges in gathering archival, because there are large archives that you can work with, sometimes – the Library of Congress or what have you – but often you’re working with small collections. You’re working with people who hold tight to the images that they have and so, you know, it’s always a negotiation. A lot of what we got was from Le Guin’s family and from Le Guin, herself, and her papers. That was really a pleasure to work with because they were very helpful and collaborative. Other sources were sometimes less so. And then there are some things in the film where we’re using “fair use” where we, you know, decided that this was a reasonable usage of the footage without licensing it. So, there are examples of that, as well. HtN: One of the things I really appreciated about your film, right from the get-go, was the way that you repeated, fairly consistently and frequently, the lower-thirds titles in your interviews. That’s something that can sometimes be frustrating in a film, where you don’t see that and you forget who somebody was. Can you talk about the pacing of those and how you came about that? I noticed that right away. AC: I love that question. I’ve never heard that one before, but you know, of course, these are all decisions you make. So, Ursula herself said, “Can you please put the lower third in every time because we forget who the people are and I hate it and they always take them away and I hate it. Can you just put them in every time?” So, you know, I did that. I added them in every time and then it was a little too much, so I pulled back a little bit. And what we did was sort of watch it, organically, feel where you kind of maybe forget, where you’ve seen a person a lot and you just know, and we kind of pulled back in those places where we were sure that people knew. But we usually defaulted to having the name on screen. HtN: But I noticed that you don’t have any lower thirds for the students in the seminar class. So what was your decision not to label them? AC: Yeah, that’s a good question. I did think about that and I think that, you know, had we labeled them, it would’ve been really arbitrary, right? I mean, the reason that we labeled the other people was because they had written something that we were referring people to. We were sort of credentialing them. The credentials of the students were intrinsic to who they were. So, it didn’t necessarily matter. I mean, of course it always matters what a person’s name is to them, but to an audience member, it might not really matter what a kid’s name was, whereas with the authors, you’re going to want to find out what their names are. So, that was sort of…that was sort of that. HtN: So, we talked about the way you first encountered Le Guin. I’m not really familiar, at all, with her later work. My knowledge of her really dates apparently from the ’60s and ’70s, but now that I’ve seen your film, I realize how much I’ve missed. Is there any of her later work that you’ve read that you would really recommend to somebody just encountering her for the first time? AC: Oh, absolutely! Some of my favorite work of hers is the later work. It’s when she’s really fully come into her maturity as a writer and it’s very touching. It’s very germane to the moment we’re in, and to the decades that preceded it. So, a couple of books that come to mind include a book of short stories called The Birthday of the World, which is one of my very favorites. There’s also a kind of quartet of stories called Four Ways to Forgiveness. It’s a real meditation on conflict and war and healing and is an absolutely devastating and beautiful book. There’s a book called Changing Planes, which is set in an airport and she just goes on these flights of fancy into different cultures, imagined cultures. It’s kind of like she’s just showing off and showing you what she can do in these quick little visits to these fantastic places. And then I also recommend her books of essays. She’s underrated as an essayist. We don’t talk about it in the film very much, but they’re so sharp and funny and useful reflections on the world. HtN: Great, well thank you very much. I really enjoyed the film. Congratulations on making it!